This was our first visit to an all-inclusive in Cabo San Lucas. One of the nice things about Cabo San Lucas is that it is a nice short 4 hour flight. We flew with Sunwing Airlines and they were great…no delays! Our transfer from the airport to the Riu Palace was approximately 45 minutes….it was a direct transfer, no other stops, not even the Riu Santa Fe which is right behind the Palace. We were greeted at reception with a fancy drink which was a nice touch. Check in was super easy as they had it all organized at a separate table….you just had to give your name, they gave you an envelope with your key and important information and that was it. Took about 10 minutes! Our room was a King Room on the 4th floor with beautiful views of the pool and ocean. It was very spacious with a small living area with a sofa bed. The bathroom was nice and big with double sinks and shampoo, lotion, etc. There is one buffet for breakfast and dinner and 2 other buffets for lunch. One of the lunch buffets becomes the steak a’la carte for dinner. The other buffet is Italian for lunch and becomes the Mexican a’la carte at dinner. You have to make reservations in advance for both of these a’la cartes. There is also a Japanese a’la carte that doesn’t need reservations…just show up when you are ready for dinner. There is a Krystal Fusion a’la carte that you can only make same day reservations. We tried all of these except the Fusion. They were all fairly good but honestly, the buffet is so great that you don’t really need the a’la carte restaurants. There are 2 infinity pools and 2 swim up bars. Lots of loungers for everyone and lots of umbrellas for those that want to stay in the shade. I didn’t really notice anyone saving the loungers so that was a nice change. There are a lot of loungers on the beach as well but not too many people on the beach since you can’t swim in the ocean. The beach is beautiful though…very long stretch of beach but it is steep down to the shore. There are vendors on the beach but there is a rope that separates them from the hotel so that was nice. I didn’t even find them really bothering anyone very much. There is a steep slope down to the water’s edge but it is a beautiful beach….it was red flagged every day (which is normal) but still people were swimming in the ocean. There were lifeguards and they did have to go in and help a couple of people while we were there….I could feel the water pulling me in just from walking along the beach so the undercurrent is definitely strong. I found the entertainment here to be the best that I have ever seen at an all-inclusive resort. Broadway type shows and impersonators….thoroughly enjoyed it every night. There were quite a few weddings when we were there. There is one location near the Mexican a’la carte restaurant which has a beautiful view of the ocean but if you look to the left that is where they keep the horses and stables….I am not sure this is my favorite location, mostly because of that. There was also a wedding on the beach which was much nicer and there is a nice gazebo at the Santa Fe as well. One wedding was performed in the lobby bar because of the rain but it was a beautiful view. The extra guests were pretty annoying for the wedding party, I am sure, since some of them wouldn’t stop talking throughout the whole ceremony! Still, a nice job was done by the wedding coordinator for a back up location. It is quite expensive to take a taxi into town but there is a bus stop just past the Santa Fe section. For 12 pesos per person you can go into downtown Cabo….on one of their local ‘school buses”. There is a bus stop just at the end of the driveway to catch the bus into San Jose….this is a proper Greyhound type bus and the cost was only 35 pesos per person. Super cheap. We went over to the Riu Santa Fe as well to check it out. They had a very nice, huge infinity pool overlooking the beach and also a big pool in the garden view section. If you stay in the garden view section it is in behind the Riu Palace and is quite a distance from the beach. 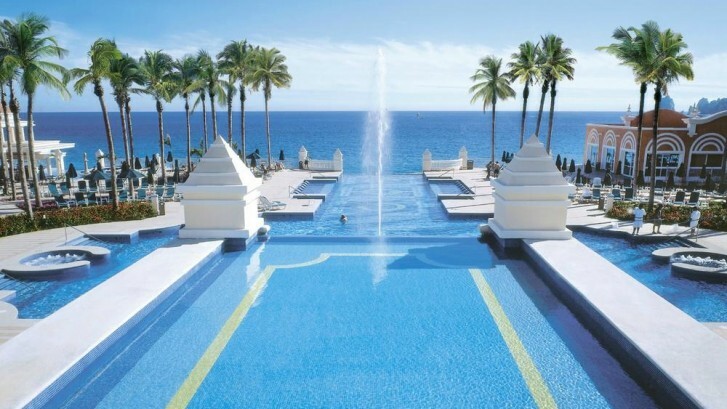 I would highly recommend the Riu Palace and even the Riu Santa Fe (as long as you book an ocean view category). It was one of the nicest resorts that I have stayed in.